Data storage is one of our fundamental economic, political and historical challenges. Data is collected from us whenever we click, charge, or swipe—it helps politicians decide who “we” are and what “we” want. Wal-mart knows how to use it to sell us things and Obama knows how to read it to take the nation’s temperature. But is there an aesthetics of data storage? Now that anybody can record almost anything, can this form of primitive image accumulation be a kind of art? “Time Batteries” handle duration differently from classic video works by artists like Peter Campus, Bruce Nauman or Joan Jonas where the dilation of time was tied to the expansion of perception. Duration is now linked to the banal but fundamental ethos of storage. I will test this thesis by presenting two works: Mary Ellen Carroll’s film Alas poor YORICK! 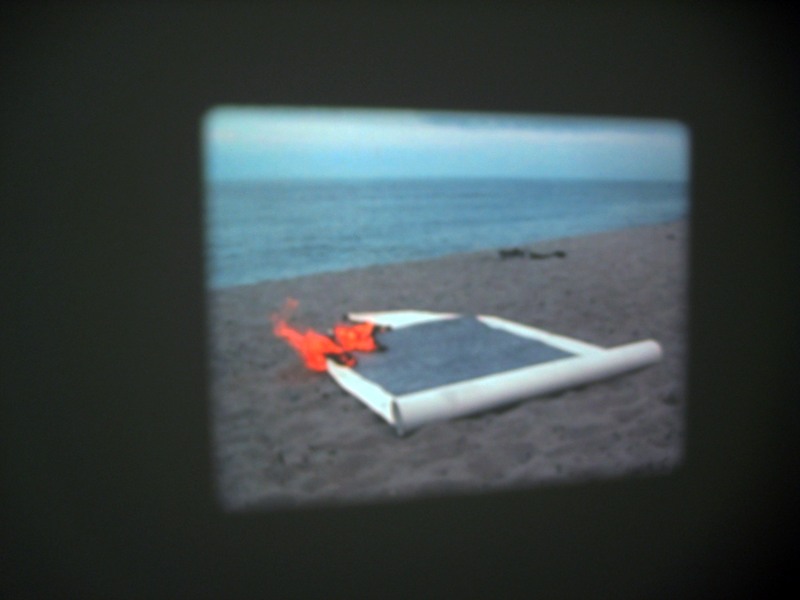 (2008) in which the artist’s drawing made from her hand transcription of the entire text of Laurence Sterne’s Tristram Shandy on a single sheet is burned on a beach in Truro, and Rachel Harrison’s Roman Holiday, a found moment of slapstick recorded from a restaurant table in Rome. I’ll discuss questions of media transfer and consumption (in fire, in boredom, and even of products) as manifest in these works, and I’ll draw a historical genealogy for a possible aesthetics of data storage. David Joselit worked as a curator at The Institute of Contemporary Art in Boston from 1983-1989 where he co-organized several exhibitions including "DISSENT: The Issue of Modern Art in Boston," (1985) "Endgame: Reference and Simulation in Recent Painting and Sculpture" (1986) and "The British Edge" (1987). After receiving his Ph.D. in Art History from Harvard in 1995, he joined the Department of Art History and Ph.D. Program in Visual Studies at the University of California, Irvine, where he taught until 2003. He is currently Professor and Chair of the History of Art Department at Yale. Joselit is author of Infinite Regress: Marcel Duchamp 1910-1941 (MIT Press, 1998), American Art Since 1945 (Thames and Hudson, World of Art Series, 2003), and Feedback: Television Against Democracy (MIT Press, 2007). He writes regularly on contemporary art and culture for such publications as OCTOBER and Artforum. Tickets - $7, available at door.